Last week we posted this article about Braydon Nichols and his father, Army Chief Warrant Officer Bryan Nichols, who died tragically in the downing of a US helicopter in Eastern Afghanistan on August 6th. what can we do? 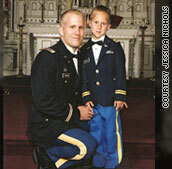 We were so touched by his story and wanted to honor this little boy and his father in a tangible way. Upon researching this tragic event further, we discovered that there were at least 10 other fathers who died in that crash leaving behind 22 children. So, Braydons story was just one of 22 other tragic stories unfolding that week. In response, we have created a campaign, Honor Braydons Dad. This campaign will collect donations to support other military families on the bases of the fallen soldiers. The donations will be used to provide these families with our Deployed Fathers and Families Guide (and other resources) to help during difficult deployments. We at the National fatherhood Initiative wish to send our condolences to those who lost loved ones on August 6th, 2011 and thank them for all that they have sacrificed. Visit Honor Braydons Dad to donate today.